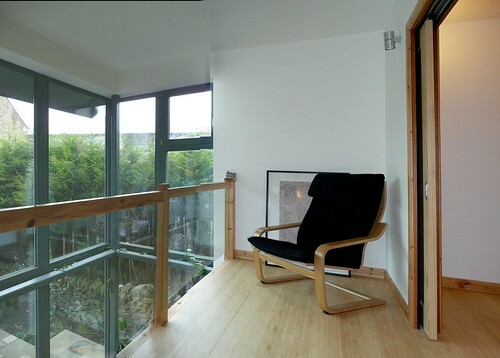 One of the first UK examples of a super low energy, self build PassivhausSee more on the Passivhaus standard. The PassivHaus Institute has pioneered a standard for low energy buildings. It includes very low energy usage and ways of achieving this. The word is derived from the idea of buildings which are fundamentally low energy and passive solar heated rather than using extra gadgets to heat them. See Passivhaus for the UK branch of the organisation. 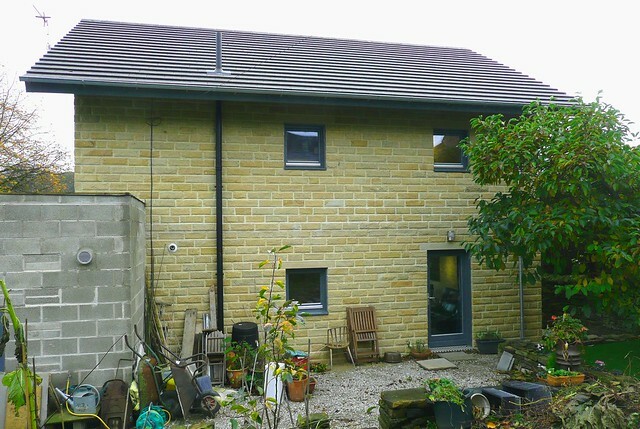 has recently been completed at Denby Dale in south Yorkshire. The walls have a stone outer skin, (on the insistence of the planners) 300mm of wall insulation and an inner blockwork skin. This is not typical Passivhaus but is similar to the type of construction most builders are used to. There is 500mm insulation in the roof. It was built on a fairly tight budget. The cost of £140,000 (excluding land) for a 104.5sq.m. 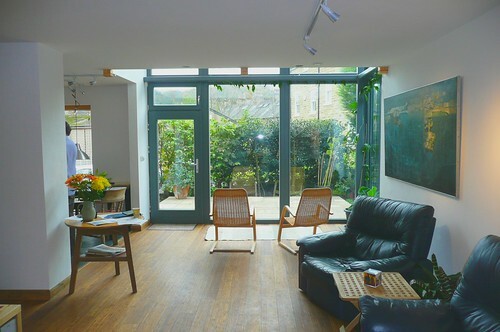 of floor space (excluding garage) works out at £1,340/ m². Unlike, say, many of the projects which feature on Grand Designs, this is a house which could become typical of mainstream house building. Most of the materials come from local builders’ merchants. It combines high insulation, high thermal massthis is about how much heat something can absorb - so it involves its specific heat capacity and its volume. It can be useful for levelling out the peaks and troughs of temperature within a house. See the page on thermal mass, and a combination of warm air and radiator heating with solar thermal. An enormous effort was put into making the fabric of the building airtight. The result was an n50 value of 0.33! the north facing rear with small areas of glazing. 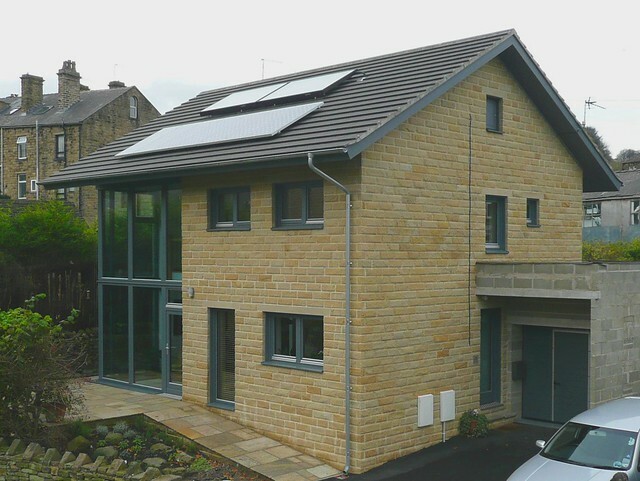 The owners, Geoff and Kate Tunstall have been strongly supported by the Green Building Company of Golcar, Huddersfield who, together with their sister company, the Green Building Store, have overseen the process from start to finish. The building itself looks like a fairly standard 2 storey 3 bed roomed detached house not unlike many of its neighbours. 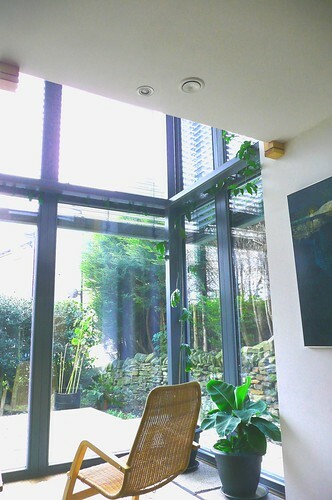 The one feature which is slightly different is the double height glazed sun space which forms part of the lounge downstairs and links with a small gallery next to the main bedroom upstairs. This faces due south and helps to not only collect heat from the sun but also allows daylight to penetrate right to the other side of the lounge. 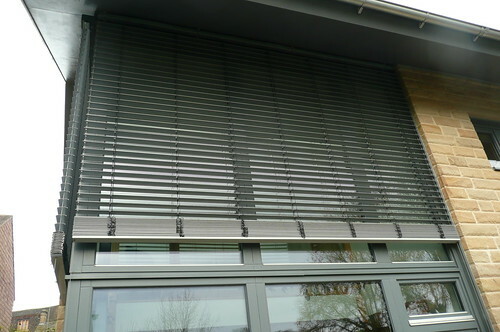 To protect from overheating in summer there are external electric blinds which come down over the glazing. The house is heated partly by gas and partly by solar panels. To cope with the variations in solar intensity, surplus heat is dumped into a 300 litre water storage accumulatorusually a large water tank used to store surplus heat (from say a wood fired boiler or thermal solar collector). see the page on Heat Stores to be used later when sunshine is lacking. The small plant room contains a Vaillant condensing gas boiler and the hot water store (the green cylinder). This particular setup recovers over 90% of the heat from the extract air. This does not come cheap (at about £4500) but provides amazing efficiency and very high air quality. Up on the right you can see the intake duct for cold outside air. It has a pre filter and a pre heater to prevent condensation in extremely cold weather. The two insulated fluespipe to conduct gas, typically ventilation air or boiler exhaust. 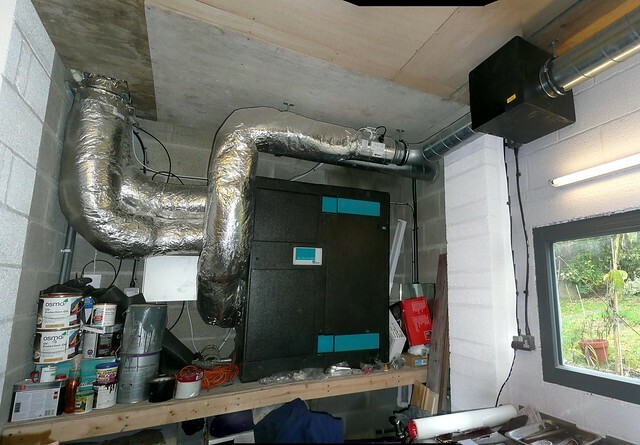 see more on Flues on the left extract stale air and introduce fresh air at the correct temperature (just below 60ºc) by means of a battery heater which sits within the flue. This heater is driven by the boiler. The owners also included one small central heating radiator in the lounge and heated towel rails in the bathrooms although it may turn out that these are not necessary. You can see the ‘Passivhaus diaries‘, a blog tracing the building process from start to finish and more info here from the AECBthe Sustainable Building Association. While this house is one of the most advanced in the UK in terms of energy conservation, it would probably only score level 3 on the Code for Sustainable HomesCode for Sustainable Homes. A delightful tool for assessing how green a home is. Unfortunately now withdrawn (2015) by this short sighted government. (CSHCode for Sustainable Homes. A delightful tool for assessing how green a home is. Unfortunately now withdrawn (2015) by this short sighted government.). This indicates the difference in the nature of rating between Passivhaus standard and CSH. A two year study on the house since it was completed shows it to be functioning well.